Get ready to enjoy a fruit slot machine like you’ve never seen before! 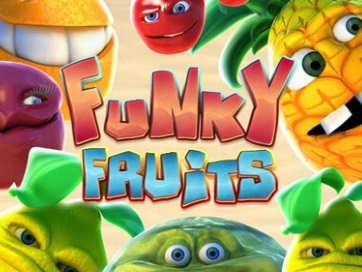 Funky Fruits, developed by an industry leading company Playtech, is a reinvented version of the traditional cherry machine. This time, you won’t be seeing cheap looking graphics and boring symbols. All of the elements are animated and each character has its own personality. If you’re ready to meet the farmer and discover unique features of this machine, keep reading this article! While most similar slots have a 3X3 reel grid, this one has five reels and 20 flexible paylines. This format is usually used for machines that can be played by any type of player, beginners included. Due to the fact that the number of lines can be adjusted, gamblers don’t need to follow a pattern and they can customize the gameplay to fit their needs. The minimum bet per line is 0.01 and the maximum goes up to 0.75. If you were hoping for more options, don’t get discouraged because the final maximum bet is valuable enough to ensure great wins. By clicking the Bet Max button, you automatically set the highest value available. The autoplay button situated next to the spin button has enough options for you to select: 10, 25, 50, or 99 automatic rounds. It is advisable to keep an eye on the game even if you’re engaging in other activities at the same time. You never know when you might lose all your hard work and be forced to start all over again. The pay table is disguised as a barrel in the bottom left corner. You must absolutely read it before you start placing your bets. It’s important to learn about fruit slots and the special features. Moreover, there’s a goofy looking farmer with an impressive unibrow and classic denim overalls. Throughout the entire game, he’s trying to collect these naughty symbols that won’t stop bouncing up and down. The farmer is one of the highest paying symbols and you’ll be rewarded with extra coins when you find five of them. The Wild brings you 10,000 coins and the chance to unlock more winning combinations. The Scatter brings up to 33 free fruit slots games that will come in handy in the long run. All the elements from the background are animated and, once in a while, the farmer will try to get your attention by doing clumsy things. He gets chased by a tractor and hurts his foot with a fork after trying to scratch the screen to get your attention back to the reels. The soundtrack is cheerful and in a perfect harmony with the theme and characters. The entire game feels like a well-developed animation rather than a video game. If you’re tired of playing the same boring machine but you love a classic theme, we can’t think of a better game for you than this one. Give it a shot and enjoy it without any deposit!